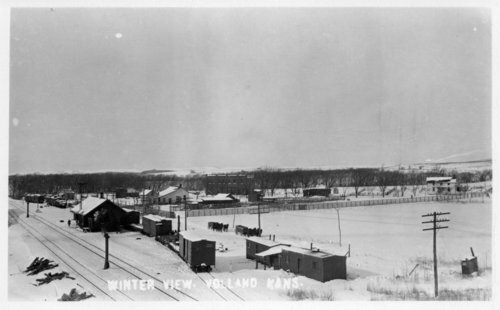 This is a winter view of Volland, Kansas, taken from the Rock Island water tower. In the center background, we see the new Kratzer Brothers' Mercantile; when this photo was taken, the interior was probably still unfinished in the building. To the left of the brick store, one sees the back of the old store and the house that sat almost against that store. To the left of those buildings, one sees the Volland Blacksmith Shop. To the left of the blacksmith shop is a railroad house. In the foreground, one sees the Chicago, Rock Island and Pacific Railway depot, side tracks, and more section crew housing. Just behind the depot are the stockyards.